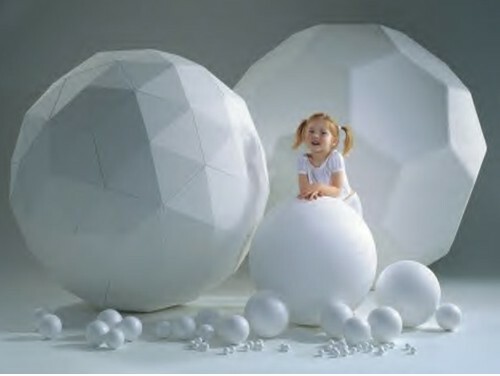 Polystyrene balls and spheres UK. 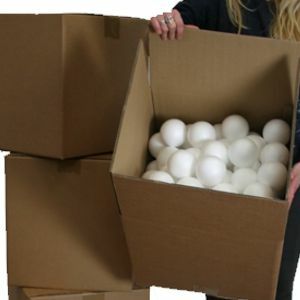 Styrofoam balls also available. From 150 mm ( 6 inch ) diameter, to 1800 mm and larger ( over 6 feet! ). up to 1500mm in solid, over 1500mm hollow. From 20 to 500 mm diameter. 20 to 120mm solid, 140 and over in 2 hollow halves. 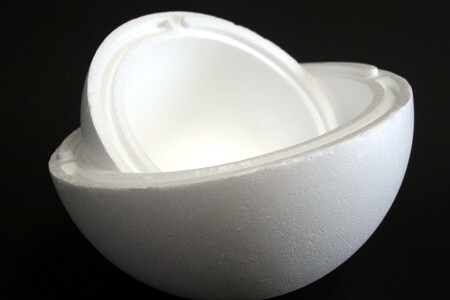 We offer a large range of polystyrene balls from 20mm in diameter to 3000mm (more than 9 feet). Supplying to department stores (for window and shop floor displays), shop fitters, craft shops, schools, universities, exhibition stand contractors, model makers, theatres, and film and television studios, we have a broad range of experience helping to bring all sorts of projects to life. 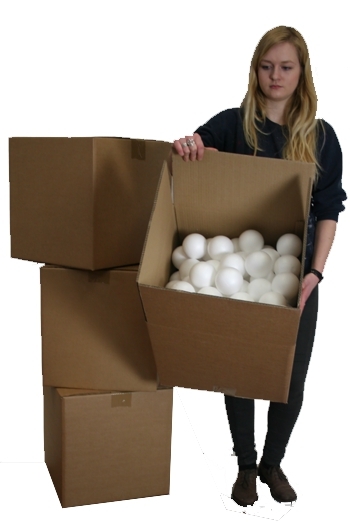 Most of our spheres are in stock and ready to dispatch for delivery next working day. However if you need something urgently we can often have it delivered same day through our dedicated delivery service. Available in painted, frosted, and glittered finishes, we can apply designs, logos and decals to brand our spheres and baubles. The geodesic shapes, often referred to as mathematical models, are made from individual technically cut polystyrene shapes. These models are available in many shapes and sizes. 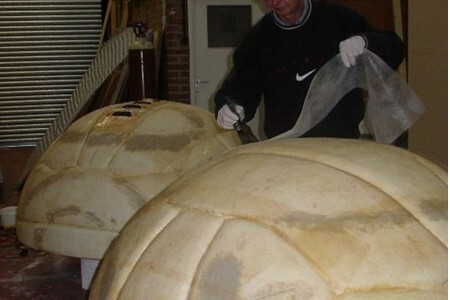 We are now able to produce these football shapes with a spherical shape, over 2000 mm (6'6") in diameter. Our polystyrene balls have been used in store windows in a variety of settings, from a sleek modern scene to traditional Christmas display. 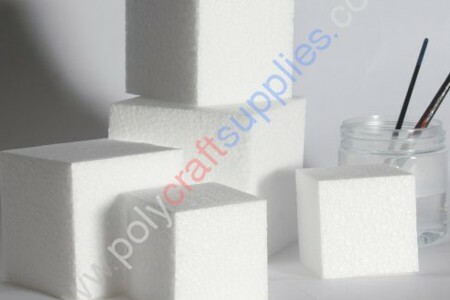 The Polystyrene we use contains a flame retarding additive - which is essential for in-store display. The solid balls are strong enough to sit a mannequin on, and the range of hollow balls go large enough to cover a head, or fit larger products inside from shoes to bags. 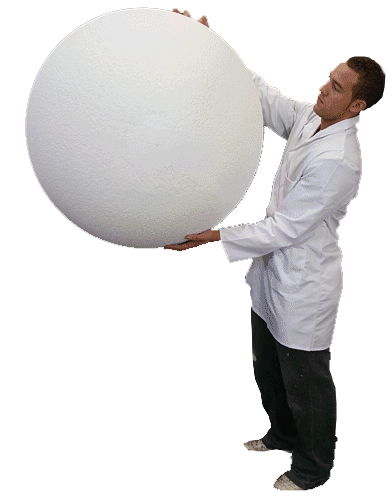 Theatre and film companies have used out polystyrene balls for everything from boulders, to snow-balls to planets. 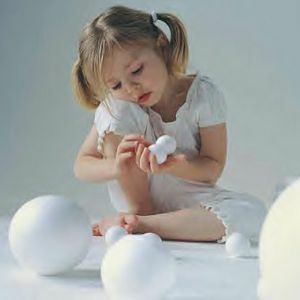 We can supply the spheres plain white, but also offer a range of different finishes. 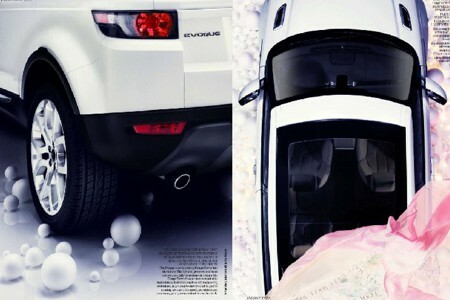 If larger balls are being used for theatre use, we would often recommend they are coated with idenden. When required, we can fit secure hanging points into the ball. We can offer discounted rates for re-sale bulk orders.Or box rates above are already discounted, for very large orders further discounts are available. We also stock a range of other craft items including eggs, cubes, rings and many other shapes. Read more. 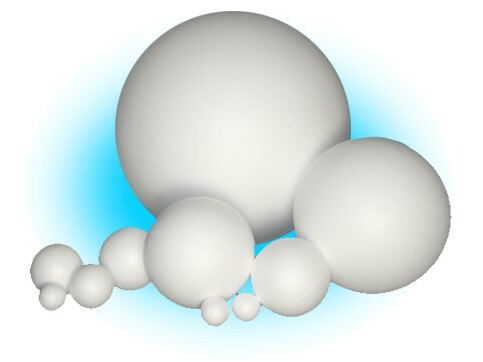 The moulded polystyrene balls are regularly used by laboratories, schools and universities for design, science and research projects. 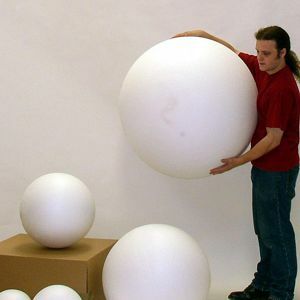 Polystyrene balls can be time saving components in models of all sizes. The moulded balls are very high density, which means they can be more accurately cut can carved into. We can produce the larger cut balls at any size required. The machinary can also be adapted to cut other shapes such as teardrops and eggs etc..
Poly balls can make a big impact for shoots and promotions. They are light enough to move around easily, and can be fitted with hanging points if required. 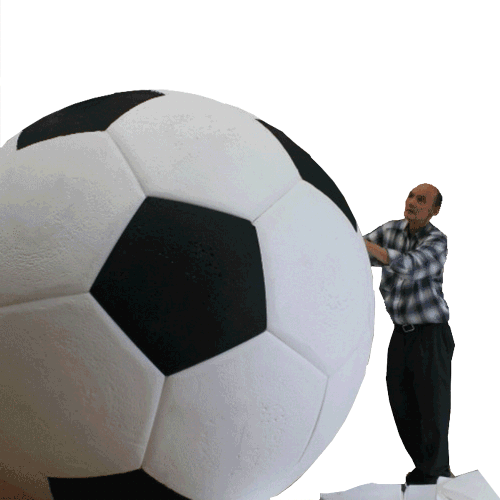 Basic logos and designs can be applied to the larger ball. We have large stocks, and can offer same day dispatch on most sizes.